The Tucson Homeskillet: The Tucson Homeskillet presents: Portobello Mushroom "Deep Dish" Pizzas! 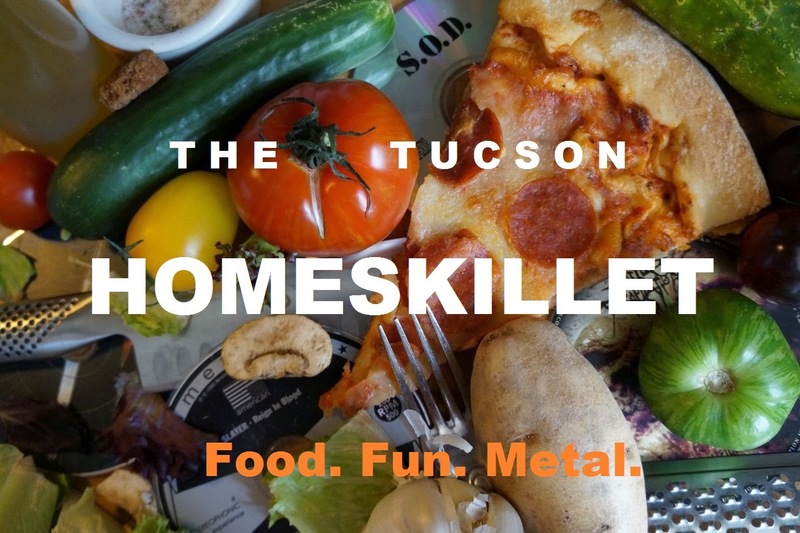 The Tucson Homeskillet presents: Portobello Mushroom "Deep Dish" Pizzas! I don't have a recipe. You don't need one. Really. If you know the basics of cooking and can assemble a simple pizza then there isn't a need for directions. Just go for it. In the newly found immortality of a screaming Shia LaBeouf, "Just DO IT!" That's it. Super simple. But simplicity is what makes this so delicious because with a fresh Portobello and quality ingredients, what you have on your plate is sheer yummy bliss. And since this is technically a "deep dish" pizza, I always have to eat it with a knife and fork. In the future I'll get to work on a New York style pizza, but, for now, Chicago rules. Okay. Let's do this shall we? Next, get yourself a grand Portobello mushroom. Not too sure what that creff is on the stem but...I just bought it this morning, so...? Take the stem off yo. Get yourself a hearty spoon with a pointy edge, cuz we about to dig here son. Dig out all the bloofy ribs and mesh. Be sure to even out the bottom of the mushroom so this cooks correctly. Like, make yourself a perfect lil' mushroom bowl. See what I'm saying? Luckily for us, basil just grows like mad in our garden. Thanks to Native Seeds we've been growing southwestern herbs from seed and the results are (usually) pure magic. So I plucked a good looking bunch for this pizza. I wish this website had Smell-O-Vison, because, man...so fragrant. Group up the leaves as such because we about to chiffonade here kid. Then roll the basil into a tight little green cigar. You want it as firm as possible because it helps when you cut to make even ribbons. Now get out a good sharp knife and start slicing the basil into little strips. If you don't know how to chiffonade, check out this VIDEO. Next, get yourself some garlic. I usually get my garlic from Sleeping Frog Farms when they're at one of the various farmers markets I go to. Their ajo rojo variety just kills for pure garlicky awesomeness. A thing of beauty....I hate to crush you. Then, with the flat of a wide knife, smash the bulb a bit and remove the papery skin. Then start dicing it up man. Tiny nibblets equals big flavor. I had some salami from the Sausage Shop lying around so I thought I'd throw it into the mix. Again, like the basil, I thought it'd be fun to chiffonade this stuff too. Why not. I was feeling frisky. I'm a crazy man I tell you...a crazy man! Salami tube: insert joke here. And slice it up to make uniform deli meat streamers. Now, I like to add some good olive oil and rub it all over the shell of the mushroom. For me, it adds a good flavor along with some color and texture when cooking. I've tried these mushroom pizzas without the olive oil and they're still tasty but...I prefer to use oil just because. I'm sure you have a preference. Of course you do, you're a free person to do what you want. Go nuts...see what works and what doesn't. Since I am a bona fide pasta and pizza freak, I always have some homemade red sauce handy. It can be doctored up for each dish that you prepare and this variety I made a few weeks ago has a bit of sweetness to it, so I thought it'd be perfect for these pizzas. Now for the fun part...let's make our pizzas! Here's how I like to do it. First, slather the base of your mushroom bowl with the sauce. Then, get yourself some bomb azz mozzarella cheese. You can grate the cheese if you like but if you have real mozzarella in your reach, I always like to just tear it off and just plop it around wherever I like. It'll all melt evenly and perfectly in the end any way and, well, I just like playing with my food I suppose. Put a nice layer of cheese on the sauce along with some of the garlic. Then pile on that salami of yours...or pepperoni, or capicola, or prosciutto, or pancetta, or sopressata, or...whatever. It's up to you. Then on top of that, add more sauce, the rest of the garlic and the basil. And then, the final touch, add more mozzarella, the parmesan and I like to shake some dried parsley on for color. That's it. Just for color. Doesn't really add anything but a little dance for the eyes. I mean, it adds a like a little bit of flavor but...yeah, not really. 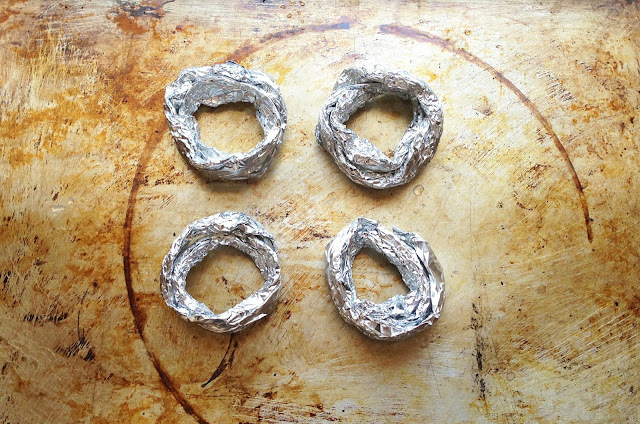 If you're making a bunch of these in a big oven, I suggest making foil rings to place under the pizzas, this way they cook more evenly and leave less burn on the base of the mushroom. But since I usually use our handy toaster oven, I don't need to go this route. Again, it's up to you and with your trials and errors, you'll find the best method. They help, but, not a necessity. Now, into the preheated oven it goes. Let's say, 20-25 minutes. You can smell the mushroom and meat cooking, you can hear the cheese sizzling and after a few minutes...bingo! A perfect deep dish Portobello mushroom pizza. Now since we use a mushroom instead of dough, this dish could easily go vegan. My basic red sauce already is so substituting real mozzarella with vegan options and omitting the meat or adding other veggies like onions, peppers, squash, etc, could be just as crazy tasty. In fact, I know it is. Like I keep saying, it's up to you. Now that you know the basics, it's time to go mushroom deep dish pizza crazy. "Lil Poundcake. 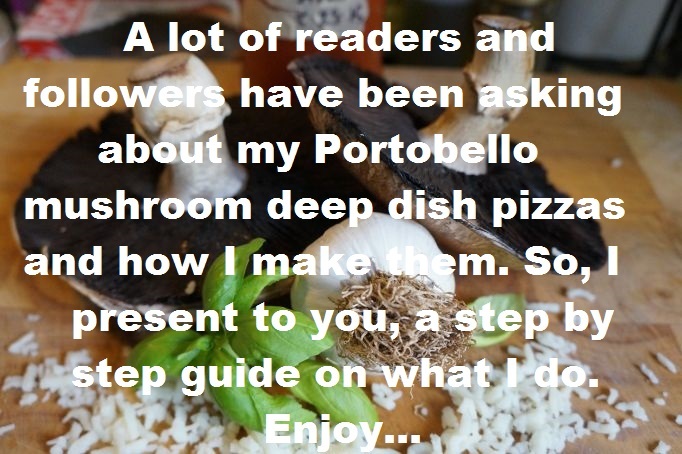 You want some Portobello mushroom deep dish pizza?" "Why do you keep torturing me human? Is this made with kitty kibble and mice? No? Then no." 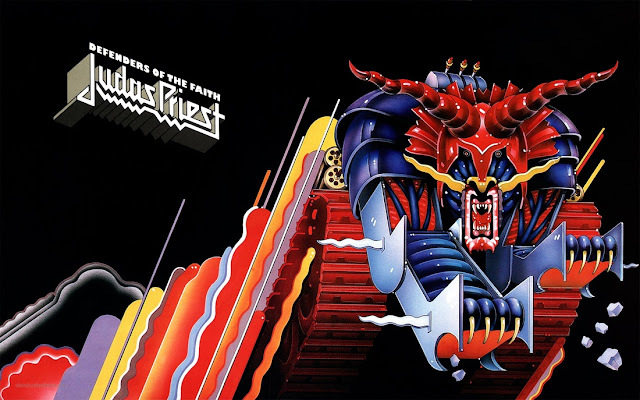 Judas Priest, "Eat Me Alive"